Did you know that one all-powerful system runs every function of your body? Your nervous system is responsible for controlling every cell, tissue and organ of the body. As chiropractors, Dr. Buffington, Dr. Waters and Dr. Valentine concentrate on your spinal health, because the nervous system runs through the spine. The benefits you may receive from care are numerous, such as improved immune function, higher energy levels, diminished pain and increased flexibility, range of motion, balance and coordination. You’ll have the freedom to pursue your hobbies and spend time with your loved ones. Our patients come to see us with many different types of health concerns and desired health outcomes. 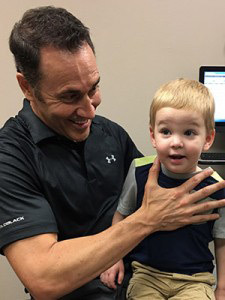 The main techniques used at Next Level Chiropractic include Diversified and prone techniques, which use a lighter touch. We’re happy to accept insurance and try to verify your coverage before your first visit, whenever possible. Contact us today to schedule your appointment!